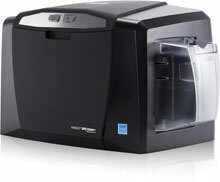 Fargo DTC1000M - Base Model, Monochrome, Single-sided printer, USB Connection with Three Year Printer Warranty. This part is also known as 047200. The Fargo DTC1000M Monochrome printer delivers the ultimate simplicity in card personalization. The affordable printer is easy to use, virtually maintenance free and economical to operate. An eco-friendly erase-and-rewrite option also makes the DTC1000M ideal for visitor badges and temporary worker ID applications. The DTC1000M prints a single color, edge-to-edge image on one side of a standard CR-80 or CR-79 identification card. The resin thermal transfer process assures clear reproduction of photo images, barcodes and alphanumeric data. The DTC1000M is the cost-effective, low- to moderate-volume card issuance solution for organizations such as casinos, financial services firms, small businesses and retailers. The Fargo 47200 is also known as Fargo Electronics	FGO-47200	.